For the past few months, John has been dealing with the ramifications of the prostate/urinary tract infection that had developed in the beginning of March. He was put on steroids and antibiotics to help treat the infections, but certain issues have been recurring, so off we went back to the vet. Yes, it is true – Bully Project has experienced its first return. After a week of living in his new home, it was realized that John was not the right fit for his adoptive family. So John is back in foster care with us, and doing well. He settled right in as if he’d never left – and he’d do the exact same thing with his next new home. It was one year ago, today, that Bully Project‘s first adoptable was officially adopted. We called her Paige, but her mom calls her Ellie. The day she was adopted will always be one of the days that make us the most proud, but it’s also the day we made a wonderful new friend in Ellie’s mom, Rebecca. So Happy Gotcha Day, ladies! You two make the most perfect pair! Over the holiday break, there were quite a few interesting animal related news stories in our area. But none quite caught my attention as much as this one did. The long and the short of it is: a family was out buying groceries to cook their Christmas meal. They brought their Cavalier King Charles spaniel out with them for the errand, and upon arriving at the grocery store, tethered the dog outside the store while they finished their shopping, leaving the dog entirely unsupervised. Of course, my immediate response was to feel pity for the family. I would be devastated if I ever lost Lucy. But after thinking more about this whole situation, I kept getting more and more irritated. 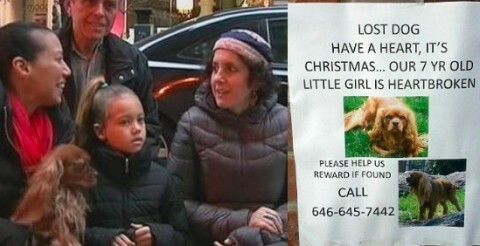 Wouldn’t the dog never have been stolen if they had simply left it at home while running their errands? Would their “7 yr old little girl” avoided heartbreak if Mom or Dad had just waited outside with the dog? Most likely. It’s been over a week since our handsome boy went “home,” and we’re now confident and ready to announce that Andrew, after nearly four months in his foster home, HAS BEEN ADOPTED! While in foster care, Andrew learned a lot of amazing things with his foster family, Melissa & Kenny. They fattened him up, they cared for him through his medical issues including persistent worms and an injured back leg, and helped him work through his slight separation anxiety and dog selectiveness. They were a wonderful foster home for him, and though they could not commit to keeping him permanently (though we’re sure they would have if they could), they were the perfect home for Andrew while we searched for his forever home! We will continue to share pictures, videos and links on our Facebook and Twitteraccounts, so make sure you’re connected to us there. How excited am I? I finally get to foster a pittie. Okay, not exactly foster BUT I am helping out my friend who is fostering Hunny! I am always so jealous when Josh has a foster. My ark is full and no fosters for me at this time…But, I get to see this smile everyday! Hunny’s first foster momma, Rennie, had to leave on vacation. What started out with a one week first time fostering “assignment” ended up being longer because who doesn’t want to wake up to Hunny’s big smile? If it wasn’t for Rennie seeing Hunny’s picture on the Facebook page of Trixie and Peanut (thanks for sharing! ), we never could have rescued Hunny. And, everyone knows how much Josh and I wanted to pull her. So when it was time for Rennie to go away, we needed a second leg for Hunny’s journey. And she really does look fantastic! Her beautiful honey eyes are shining straight through the…whining, and crying, and sulking and cone-wearing. Our poor, sweet girl is just miserable, and quite frankly, we don’t blame her. She’s dealing with three recoveries at once, and gets zero time out of the cone of shame. She has to wear absolutely all the time, to prevent damage and infection to her gorgeous eyes. Springtime Means More Bully Project! Nothing gets me up early and missing my own dog run time with my pooches EXCEPT Bully Project! Last fall, I came up with a crazy idea of offering regular FREE training classes in my own backyard Fort Tryon Park. I went to a former colleague, Kelly, who started this amazing non-profit here in NYC to help end dog-fighting and encourage responsible dog ownership. I had volunteered previously at Bully Project’s classes in a different neighborhood and knew they had helped the community. I witnessed dog owners replacing rope around their dogs’ necks with the group’s free leashes and collars. Some people wanted resources such as low-cost altering but didn’t know where to go. Some needed help with mange, some needed guidance with training and manners. It was apparent that all of these people LOVED their dogs and just needed some help. One thing we didn’t do (and don’t do now) is judge. It’s so nice to see a program in action and working. Up till this point, I have only briefly mentioned my first foster dog. Lately, several people have been asking me about it, and I think it’s time I talk about it. Nearly a year ago, I decided to become a foster parent, so I got Lucy leashed up and went to the local shelter. I wanted Lucy to be there for obvious reasons: any dog I took in had to get along with her. That was pretty much my only requirement. We met three dogs. The first was too dominant. The second, too shy and stand-off-ish. The third, well, as “Goldilocks” as it sounds, she seemed just right! It was settled that I would leave her at the shelter overnight, and pick her up the next day. See how well he captured me us? Stephen was holding this thing and it kept on flashing at us – I had to get up real close to it so he would let me sniff sniff around it, so I could make sure it was safe for my Dad. Once I told him that it was ok, I let Daddy be in the pictures, too. So, while I was away (in Disney World – what a nerd! ), Pinky went off to Instinct Dog Training here in New York City. I tried to line up a short term foster home for her, but wouldn’t you know it? All the foster parents I know here already had a foster dog in their care. Instinct made a very generous offer to board Pinky that I simply could not refuse. I, of course, told them that I was only working with her using positive reinforcement training techniques, so I would appreciate if they did the same, as she was doing so well with it. They made this short video of her for us, and we LOVE it. It truly shows off Pinky’s playful personality and penchant for affection. And above all that, what a quick learner she is! Before Pinky left, she only knew “sit,” “stay,” and “touch” commands. Now she’s got a great “down” and has even started a bit of agility! We couldn’t be more proud of the work she accomplished! Whenever Dad takes out the suitcase, I like to mope around the house and make it look like I’m sad that he’s going away. But I’m not. Because when Dad goes on vacation, Crazy Uncle Matt comes over to play! I love, love, LOVE my crazy Uncle Matt and we have the best, best, BEST time. Dad even tells other people that I love Uncle Matt more than I love him. So when Dad went to Disney World (I hear they have really big mice there! I would chase them all over the place! ), I got to spend a whole week playing and snuggling with my most favorite second favorite person in the whole wide world. Sometimes I feel bad that I have such a good time with Uncle Matt, but then I remember that Dad lets him stay with me for that exact reason. Matt makes me happy, I make him happy, and that makes Dad the most happy! Two months ago, a whirlwind came into my life. Petite pittie Pinky came bounding into my heart (and home!) with a zest for life, a penchant for human affection, unending energy and playfulness; a Pandora’s Box of joy and challenges, simultaneously. Pinky’s pre-rescue story is sort of a sad one. She was, quite literally, locked in a crate for a year. I imagine it was because of her intimidating energy level. Most likely, she had to do everything in her crate from eat, to eliminate, to sleep andeverything nothing else a dog needs to do, like exercise. Finally, a family member secretly clipped the lock and called for her rescue. So it’s no wonder she’s such a whirling dervish, but I am always amazed by the resiliency of dogs. After such neglect, you’d think she wouldn’t know how to behave around people or dogs, but it’s quite the opposite. Sure, she’s a bit in your face, but all she wants is for everyone to love her. This little girl needs a name! Who doesn’t love a puppy? Especially a clumsy, big-footed one? While at the dog park today, we met an old “dog friend” who has opened her home to a brand new pup – a 5 month-old Cane Corso/American Bulldog mix who is so delicious you want to eat her up! Although she is on the shy-side, she quickly warmed up to all the new faces. She loves dogs (she has an awesome, handsome big brother) and tried to make friends with the scruffy terriers. We’ve got a very special Adoptable Pittie of the Week today! Keep reading to learn all about her. Not long ago, I was having drinks with friends to celebrate the passing of one the dogs in our “pack”, Robbie. While sipping my martini, a beautiful dog appeared on my Facebook newsfeed. Bebe was my type of dog: beautiful (even with cropped ears) along with nice SAFER evaluation. Her time at Animal Care & Control was up and she was on “the list.” I shared the picture with friends and we all said, “Aw,” and that was that because none of us were able to take her. No room at the room! DISCLAIMER: there are graphic photos in this post. If images of blood or injured dogs upset or offend you, please do not continue reading. Thank you. One year ago, I had the scariest day of my life. I was in Las Vegas with three friends, celebrating one of their birthdays, and we were having a great time! A beautiful room at Bellagio overlooking the famous fountains, delicious dinners at world-renowned restaurants like Yellowtail and China Poblano, and seeing eye-popping shows like The Phantom of the Opera – The Las Vegas Spectacular andCirque du Soleil’s Ka. So what’s so scary about that, you ask? Exactly one month ago, Pinky whirled into my life, and to be perfectly honest: I didn’t think I was up to the task. Remember that first post I wrote about her: he Whirlwind Foster? Well, it wasn’t an exaggeration. She had, and has, so much energy. But she did not get adopted as quickly as I’d initially anticipated. A sidewalk encounter yesterday showed me just how far she’s come in this past month. The neighborhoods in New York are just like neighborhoods anywhere else. In fact, sometimes I think we get to know the other people in our areas better than in suburban places simply because of the close proximity in which we all live. There are several people now in Hell’s Kitchen who know me as “the guy with all the dogs.” I think they know I only have two at a time, but over the past few years, they have seen me walking at least 7 different dogs. They’ve gotten to know them all, and I’ve gotten to know them. It’s been quite…interesting. Does the breed really matter? I get this question at least once a day, but usually as a follow-up to: “What breed is your dog?” When I answer, “A pit bull mix,” that question immediately follows. And honestly, sometimes I wish I could ignore it. I love my dogs, no matter what their breed make-up is, so that question, and its answer, are completely inconsequential to me. Regardless, I still answer, and I usually tell them something to this effect: “I don’t really know, she was found as a stray and I never spent the money to officially find out.” But part of me wonders why it really matters to them. For the most part, the inquisitor is a complete stranger, and we’ll most likely never see each other again. They like my dog well enough to pay attention to her, pet her, let her lick them – the whole works. So why can’t they just like my dog for the dog that she is and leave well enough alone? It is true, very good dog owners can lose their dogs. Currently, a good friend’s dog is missing in Aspen and another friend’s terrier was lost for three hours a couple of days ago! And, I am embarrassed to admit, this week, I managed to lock my precious older dog, Rosie, the miniature pinscher, out of my apartment. She went roaming the building while I slept away with my other animals. I had assumed she went to her spot on the couch where she has been sleeping lately. When I woke up, I couldn’t find her! I couldn’t believe it…I searched high and low, but she was nowhere to be found. I am SO lucky that my lovely dog-owning neighbors took the “stray” into their home for the night. Rosie never left the building and probably was really only “lost” for about 15 minutes before she was “rescued” by my neighbors. Through a few signs I posted in my building and Facebook, all the dots were connected and I knew Rosie was safe.